The New Boating Under the Influence law amends Georgia Code § 52-7-12, which lowers the BAC from .10 to .08 for BUI, adds any glue, aerosol or other toxic vapor to the list of intoxicants, and includes accelerated and mandatory penalties for First Time and Repeat Offenders. Georgia Senate Bill 136 was signed into law on April 23, 2013 and effective date of May 15, 2013. 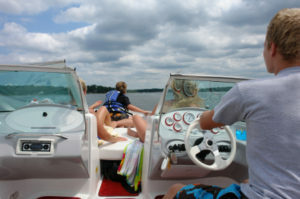 The cornerstone of the new Georgia Law was the Boating Under the Influence (BUI) reduction in the Blood Alcohol Concentration from .10 to .08. This reduction was designed to be more in-line with the Georgia automobile Driving Under the Influence standard. Further, First Time and Repeat Violators of the Boating Under the Influence law, after May 15, 2013, are subject to stiffer mandatory penalties that are similar to those that were put into effect in 2008 for automobile Driving Under the Influence violations. The changes to the Georgia BUI Law were brought about after two child fatalities that were attributed to a vessel operator allegedly Boating Under the Influence. The new BUI Law Jake and Griffin Prince BUI Law was named in their honor. The intent of the new Georgia BUI Law is to have a lower threshold to take impaired operators of the water and punish them more severely. The high profile penalty of tying a Boating Under the Influence boating license suspension to a person’s automobile driver’s license, although discussed, was not included in the final bill. New Georgia law sets the blood-alcohol limit at .08 for boaters, the same for Georgia drivers on the road. (5) For the purpose of imposing a sentence under this subsection, a plea of nolo contendere based on a violation of this Code section shall constitute a conviction; and (6) For purposes of determining the number of prior convictions or pleas of nolo contendere pursuant to the felony provisions of paragraph (4) of this subsection, only those offenses for which a conviction is obtained or a plea of nolo contendere is accepted on or after May 15, 2013, shall be considered; provided, however, that nothing in this subsection shall be construed as limiting or modifying in any way sentence enhancement provisions under Georgia law, including, but not limited to, provisions relating to punishment of recidivist offenders pursuant to Title 17. (n)(1) If the payment of the fine required under subsection (m) of this Code section will impose an economic hardship on the defendant, the judge, at his or her sole discretion, may order the defendant to pay such fine in installments, and such order may be enforced through a contempt proceeding or a revocation of any probation otherwise authorized by this Code section. (2)Inthesolediscretionofthejudge,heorshemay suspend up to one-half of the fine imposed under subsection (m) of this Code section conditioned upon the defendant’s undergoing treatment in a substance abuse treatment program as defined in Code Section 40-5-1. According to the DNR, in 2012, Rangers made 180 BUI arrests statewide, with Lake Lanier accounting for 60 of those cases. The new Georgia 2013 Boating Under the Influence Law will hopefully encourage people to not operate a boat while under the influence of drugs or alcohol, or risk potential serious charges and fines like those associated with a Georgia DUI, or worse the potential injury or death of another person. At A. Bishop Law, our Georgia boat injury lawyers welcome any questions about boating safety and boating law. If you, a family member, or friend has been arrested due to a Boating Under the Influence charge, please Call or Email us about any questions you may have. Your initial consultation is free and confidential.